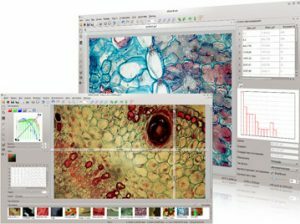 Altami Studio is developed for image capture, analysis and processing images as well as for conducting measurements. Images can be received with the help of the research equipment: microscopes, telescopes, X-ray, and other apparatuses. Monitoring and measuring are available in real-time mode (images are received from camera or other capture devices). The most popular operating systems: Windows, Linux, Mac OS X – are supported by cross-platform software Altami Studio. The application fully supports all kinds of capture devices with Microsoft DirectShow interfaces (most widely used in Microsoft Windows operational systems). Digital ocular cameras DCM/MDC, high-speed video cameras USB 3.0 Point Grey, Canon PowerShot and Canon EOS are also supported by Altami Studio. The application also works with such popular formats as bmp, jpg, tif, svg, and so on. Demo-version of the application is available without prior registration or requests. Before making the decision, you can check if the application suits your tasks. If you have any questions, fell free to contact mail@alelso.com. We will answer you gladly. Altami Studio allows to process image stream received from camera or another device of image capture (or video capture) in live mode. It is also possible to apply measurements and filters to the image stream in real time mode. This can be very convenient as you do not have to waste your time on capturing and processing images. It also helps if you monitore moving objects or compare images. Altami Studio provides the opportunity to fully use the capture devices, to save all settings, and to work in real time mode. You can save the document with all its settings (including information on camera) and continue working with it by the next launch. All these possibilities save your time and allow to use the capture devices for the wide range of tasks. For example, Altami Studio supported by the Canon EOS cameras and Canon PowerShot, as well as high-speed USB 3.0 video cameras Point-Grey. Altami Studio provides numerous possibilities for measuring and marking, including live measuring. You can measure the interval between two points, the area or perimeter you need (with the help of special instruments — figures), mark the point of interest, and indicate the direction. For each figure, the user can select the style and color of lines, color of background, type of notch, and edit the subscription. In order to make your work more convenient, the application allows you to indicate the scale in real measurement units. The application provides a wide range of raster operations. You can rotate the image, crop it, resize it, smooth it, perform brightness alignment, find edges, broaden the image, convert it to gradations of gray, adjust brightness and contrast with the help of the histogram, etc. A lot of work is fairly routine and boring activities such as counting objects, determination of particle size or classification. But often it is necessary, for example, for quality control. Altami Studio provides the opportunity to detect the shapes automatically. It is done with the help of special filters which detect the shapes on the raster. Before the automatic detecting you can edit the image with the help of any filters. After the filter is applied, users can correct the results if they need to. These features facilitate the working process very much when you have to detect many similar shapes. The image and all information on it (calibration, measurements, filters, information on camera) are contained in one document. After you have worked with the document, you can save it in adfx format and next time continue working with it. That means, all your settings (including information on camera) are saved. You do not have to waste your time on making necessary adjustments upon each launch. Report summarizes results of your work. It can contain the image itself and information on calibration, measurement, and filters. Altami Studio allows to generate different reports on one or several documents. Articleanced report can be generated with the help of the report editor. After the report is generated, you can edit it. You can also generate the fast report with the previously specified settings. That means, you can create the report depending on your needs and time you have. Altami Studio provides the opportunity to save the session you work with. By the launch of the the application you can continue working from where you stopped. So, in case of an emergency closedown, you do not lose your information.